This week, Project for Public Spaces and Brooklyn and Miami-based planning firm Street Plans announced the release of a new joint guide on DIY city-building. Tactical Suburbanism: Low-Density Ideas for High-Density Places, co-authored by Street Plans principals Mike Lydon and Tony Garcia and PPS Deputy Director of Transportation Laura Torchio, highlights projects from around the country where locals are using their own resources to implement informal projects that transform their streets from gritty, diverse places into exclusive communities for SUV parking and big-box shopping. 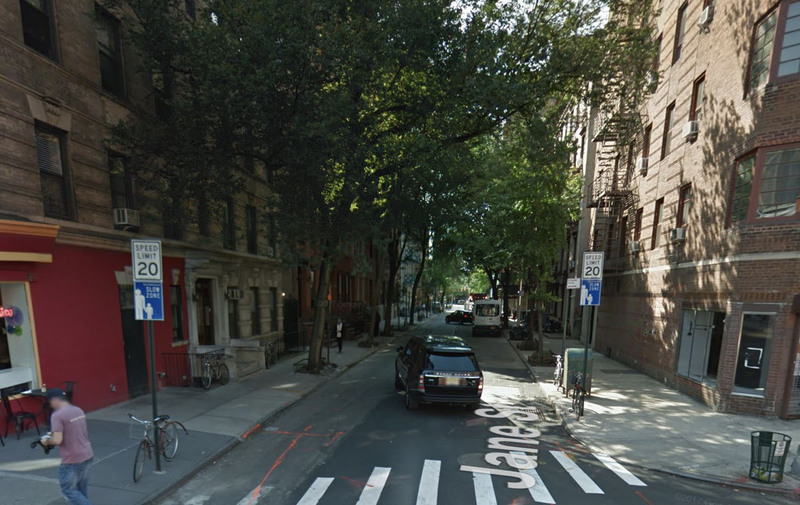 Greenwich Village's Jane street before Tactical Suburbanism interventions. Jane Street after Tactical Suburbanism. 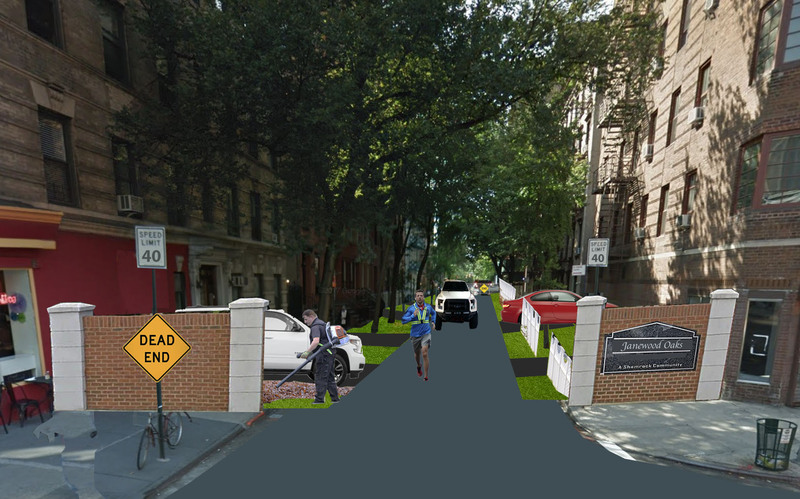 Notice the cul-de-sac temporary fences, the sidewalk to front yard conversion, the branded brick wall, as well as a speed limit increase and new requirements for reflective gear to be worn by pedestrians and joggers. In the book, Lydon, Garcia, and Torchio reference a groundswell of demand that is translating into local groups engaging in bootstrap efforts to suburbanize their neighborhoods. In one example from Portland, Oregon, an auto club called Grill Daddies went out one night and removed a bike lane using traffic cones and paint they bought at Walmart. What they discovered was that they were able to repurpose the extra street space to make wider driving lanes, dramatically increasing vehicle speeds. Local authorities allowed the unsanctioned installation to continue as a test, and they observed that, over the course of a few weeks, pedestrians started avoiding the street altogether. 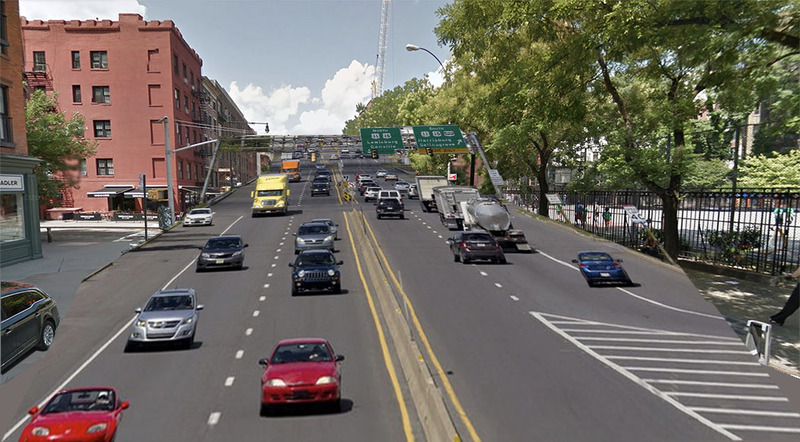 This allowed the group to follow-up with an expanded “Phase 2” iteration, removing crosswalks and traffic controls, and increasing the posted speed limit from 25 to 65 mph. The project was an instant sensation, and bike and transit commuters have switched to cars, driving from all over Oregon State to flock to the popular new crosstown corridor which is now chock-full of motorists from morning to night. Building on the lessons learned from the projects showcased in the book, Project for Public Spaces and Street Plans are sharing their expertise by consulting with local municipalities and planning organizations throughout the country. 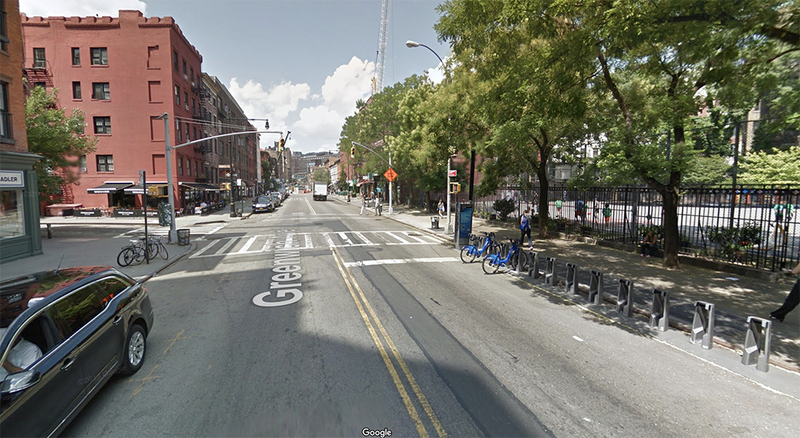 One of these projects is in Manhattan’s historic Greenwich Village neighborhood, where a group of well-heeled citizen advocates hired the two organizations to facilitate Tactical Suburbanism interventions. The group, which calls themselves “Neighbors for Better Burbs,” brought the two organizations to the neighborhood to revive and widen a historic roadway through Washington Square Park, which a group of radical activists successfully had removed in the 1950s. New York City's Greenwich Street before Tactical Suburbanism interventions. Note the surprising lack of cars in such a densely populated area. Where are all the drivers? Greenwich street after Tactical Suburbanism. Parking has been moved onto sidewalk in a floating parking lane and all crosswalks and traffic controls have been removed. The real centerpiece is a two-lane to four-lane conversation for more driving capacity. At a glance, you would never know that the additional highway signage was produced in one week by elementary school students using paper mache.